The latest versions of iOS replaced the longstanding “Videos” app with a new app called “TV” that includes an all new interface to manage movies and videos downloaded to an iPhone or iPad. 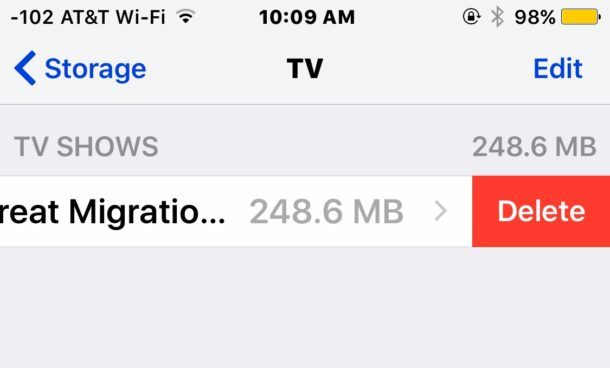 While the old Videos app made it simple to delete and remove movies from the iPhone or iPad, the new TV app offers a less obvious method of removing video from an iOS device that is unique to deleting things inside the TV app. We’ll show you two different ways how to delete a downloaded movie from the TV app within iOS. 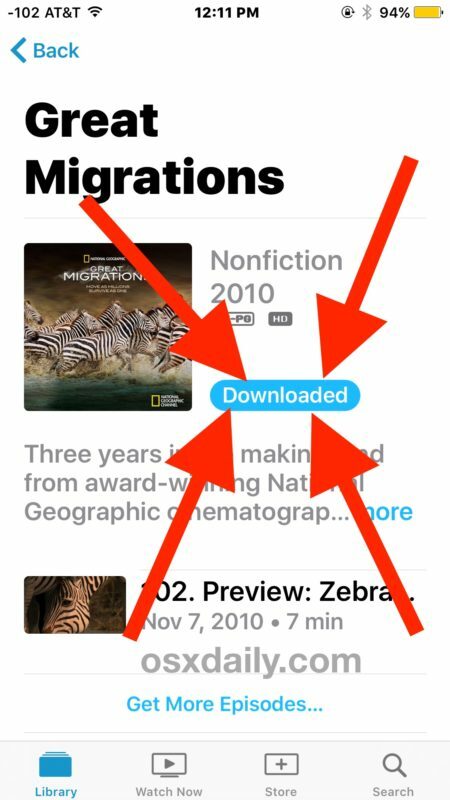 If you don’t have the “TV” app on your iPhone or iPad it’s likely because you have not updated to a recent version of iOS, or maybe you deleted it. 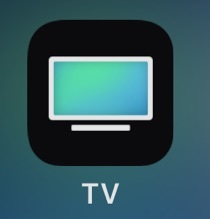 To be clear, the iOS TV app is not to be confused with the Apple TV hardware device. 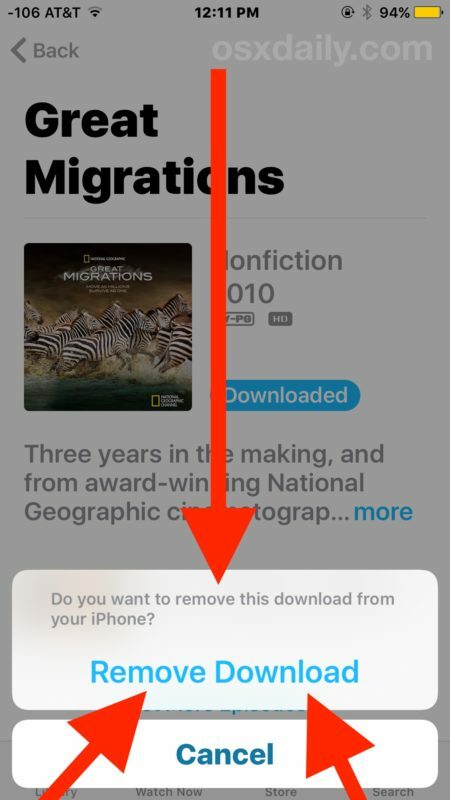 Obscuring the remove option inside the downloaded text button may seem a little counterintuitive to what many users are accustomed to in iOS, but perhaps that functionality will carry over through other delete abilities in future releases as well. You can use whichever method works best for you, both will delete a movie or video from the iOS TV app. This works the same on any iPhone or iPad with the TV app installed, which used to be called the Video app. Of course if you deleted the default TV app from iOS then you won’t have it installed on the device and would not have this ability in general, let alone any videos stored within the TV app. Apple really needs to hire someone who does a proper job of naming things. Their names for stuff are rediculous. Do the bigwigs their just call their kid, wait for it, Kid? Apple is about security and simplicity* (*when possible and doesn’t interfere with security). Has the “TV app” not made it to Austrralia yet? Thanks for this article. Now we need a replacement for the delete all email insolvent. Doing it by checking off each one before mass deletion is ridiculous. Thanks for a great site! The first method doesn’t seem to work for the home videos content (my movies I’ve transferred from a sync via iTunes), or am I missing something? I have successfully removed those via the second method (manage storage). But I don’t seem to get a “download” option when looking at the Library\Home Videos content. Same here, I see no way at all to delete from the TV app. At least the Videos app would allow me to delete my downloaded movies from the app. I can’t believe how bad Apple’s internal apps are in comparison to others. They really seem to miss the boat, I wonder if someone else submitted this to the app store if would even be approved. Just having to find and click on the downloaded button is cryptic in itself. It’s Dec 2017, I’ve just bought a new ipad and searched google to find out how to remove home movies from this new TV app, and obviously there is STILL no actual answer to the question y’all posed in Feb 2017. TV app is not available. I have latest iOS and video app. Can’t even search TV app. I guess it’s not in Canada?? I would like to know when we’ll be able to delete “Up Next” entries on the Watch Now page. If you’re in one of the linked apps and happen to click on a show and then decide you don’t want to watch it, it still shows up as Up Next and never goes away. Still Video in the UK. I am in the UK, have the latest version of IOS on my iPad but, like other of your followers, do not have the TV app. I have searched for it in the App Store but to no avail. You might want to publish an amendment to your article. iPhone 7, Canada, IOS up to date: no TV app. Still have Videos, which can not delete captured video at all. Thanks for replying to my question !!! greatly appreciate the help!! Like the 2 posters above, I don’t have the first option on my iPad … EXCEPT that 2 days ago the button appeared for my home videos. However, since then (after the next load/sync via iTunes) the button has mysteriously disappeared! Can anyone explain how to make the “Downloaded” button appear??? “Open the “Settings” app and go to “General” and then to “Storage & Usage”. Doesn’t work at all,videos still in the TV app. Maybe just delete the TV app and then reinstall? Bad programing. Anyway, I think I’ve found a workaround, deleted the videos in the I-tunes itself, new sync, then had to restart the i-phone for the videos to actually dissapear.